Khader Adnan’s 66 days of hunger strike under administrative detention, without charge or trial, sparked global discussion, outrage, and movement – perhaps the largest ever seen in the long history of the Palestinian prisoners’ struggle – as Adnan’s courage, steadfastness and strength inspired solidarity the world over. During that time, it was on many occasions expressed that Khader Adnan should be charged, or released. Administrative detention is a particularly appalling mechanism of political detention – based on secret evidence, with no cognizable charges and no opportunity to confront said ‘evidence’ – used arbitrarily by Israel to hold Palestinian organizers for six-month renewable periods. The abolition of administrative detention (a call which has been taken up by Amnesty International) is a long-term demand of the Palestinian prisoners’ movement – and Israel’s use of this system violates international law. However, it must be noted that “being charged” in the Israeli military courts, the justice system that governs Palestinians in the occupied West Bank of Palestine, is in no way a solution for Palestinian political prisoners. Any trial provided to a Palestinian political prisoner under such a system is fundamentally unjust and a mechanism of perpetuation of occupation. The military courts are not an alternative to administrative detention; instead, administrative detention is one piece of the structure of mass imprisonment and military rule constructed by the occupation. Given the prominence of the “charge or release” conversation in Khader Adnan’s case, it is important to explore what being “charged” in Israel’s military courts means for Palestinians under occupation and apartheid. Out of 4,489 Palestinian political prisoners currently held in Israeli jails, 309, including Khader Adnan, are held under administrative detention. Imprisonment is a fact of life for Palestinians;over 40% of Palestinian men in the West Bank have spent time in Israeli detention or prisons. There are no Palestinian families that have not been touched by the scourge of mass imprisonment as a mechanism of suppression. Palestinian political prisoners in Israeli jails come from the West Bank, Gaza Strip, Jerusalem, and Israel. All – including the Palestinians of ’48, who hold Israeli citizenship – face deeply unjust structures throughout the process of arrest, charge, trial and sentencing. Far from being an objective, neutral or beneficent system for Palestinians, the Israeli court system is part and parcel of the mechanism of occupation, bolstering and serving as a direct arm of military/state power in enforcing occupation control over Palestinian lives and land. The Israeli military retains for itself the right to declare any Palestinian organization ‘illegal’ and thus prosecute membership or association with that organization. Most Palestinian political parties, including Islamic Jihad (which is one of the four largest political parties in Palestine), as well as countless labour unions, student groups, women’s organizations, and other sectoral groups, fall squarely into the category of ‘illegal organizations’ and a large number of Palestinian political prisoners who have been “charged and tried,” are serving sentences for ‘membership in an illegal organization,’ ‘support for a hostile organization’ and similar charges. Israeli military trial judges are active members of the Israeli military; many are former military-court prosecutors, and not all military judges are required to hold completed legal training. It must be noted that the net effect of “trying” a Palestinian for membership in Islamic Jihad, the Popular Front for the Liberation of Palestine, Hamas, or for that matter, Fateh, all of which remain illegal organizations under the arbitrary Israeli military orders governing the West Bank, is to place that person in prison for a minimum of two years for membership in a political party. Rather than encouraging such a structure as an alternative to administrative detention, it is incumbent upon those of us who would stand in solidarity with Palestinian prisoners to recognize that administrative detention is one piece of an entire system that exists in order to buttress occupation and undermine Palestinian existence, resistance, and organization. In order to build solidarity, we must refuse to accept as normal or legitimate the criminalization of Palestinian resistance and politics by the Israeli occupation. Palestinians from Jerusalem, in particular those from East Jerusalem occupied in 1967, face a dual system of law, usually being held for interrogation under the military system before transfer to the Israeli civil system for trial, but under the category of ‘security prisoner.’ Palestinians from the Gaza Strip, prior to 2005, were subject to the same military orders as prevail in the West Bank. Following the 2005 “disengagement,” Palestinians from Gaza abducted by the Israeli military are now held as ‘unlawful combatants,’ and subject to an administrative detention scheme with no six-month limits. Palestinian political prisoners who are citizens of Israel are charged as ‘security’ offenders in the Israeli civil system, depriving them of rights afforded to criminal defendants. ‘Security offenders’ may be held for 60 days without being charged and denied access to a lawyer for three weeks. They are subject to the same interrogators from the Israeli Security Agency as are prisoners from the West Bank and Gaza – and thus the same tactics of abuse and inhumane treatment amounting to torture. The Israeli court systems – certainly the military system, but also the civil ‘security’ system – are no solution for Palestinian prisoners. Instead, those systems are mandated to enforce the rule (and the illegitimate “law”) of occupation and apartheid. 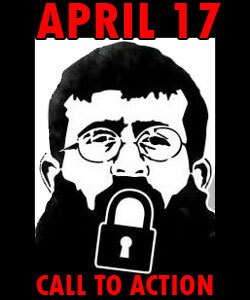 Khader Adnan is the latest in a long line of heroes and heroines of the Palestinian prisoners’ movement. Over the years, many of them have used the hunger strike – Adnan the longest – as a powerful weapon of dissent and resistance, placing their bodies on the line to confront the occupation within its own prisons. Most recently, in October 2011, hundreds of prisoners engaged in a hunger strike for over twenty days demanding the end of isolation and solitary confinement. Many of those prisoners have been held under administrative detention; many thousands more through the ‘trials’ and ‘convictions’ of the Israeli security regime. All of those prisoners need continuing support and solidarity, and the growth of such solidarity is one way in which Khader Adnan’s hunger strike, and his courage, will continue to challenge and confront the occupation. 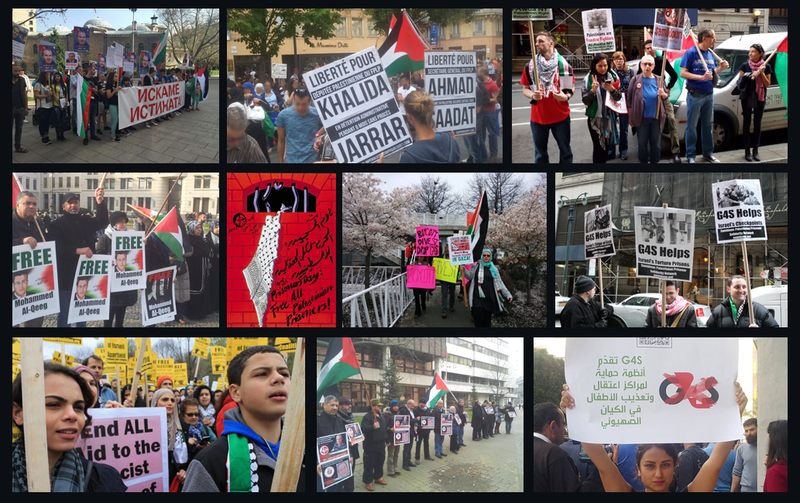 An international coalition of prisoners’ rights and Palestine solidarity organizations have called for global mobilization for April 17, Palestinian Prisoners’ Day (and what will be the day of Adnan’s release.) Such a global mobilization is also an opportunity to link the struggle of Palestinian prisoners in mutual solidarity with political prisoners elsewhere, from Leonard Peltier to Ricardo Palmera to countless others in the jails of the U.S., Canada, and the world. This includes Palestinian political prisoners in international jails; the 65th day of Khader Adnan’s hunger strike was also the 9th anniversary of Dr. Sami al-Arian’s arrest. Al-Arian remains under house arrest in Virginia today, years after he was acquitted on the majority of charges – and convicted of nothing – by a jury, because he refuses to be forced into becoming an informant on the Palestinian community. Charlotte Kates is a Palestine solidarity activist with the Boycott Israeli Apartheid Campaign (http://boycottisraeliapartheid.org) and Samidoun Palestinian Prisoner Solidarity Network (http://samidoun.ca )in Vancouver, on unceded Coast Salish Territories. She is a member of the Organizing Committee of the US Campaign for the Academic and Cultural Boycott of Israel (http://www.usacbi.org) and is active with the National Lawyers Guild and its International Committee(http://www.nlginternational.org).